Snakes are colorful and interesting pets. Each species has unique characteristics and requirements, regarding food, handling, and habitat, so some breeds are more popular than others. Favorite pet snakes are in the families of Colubridae, Boidae, and Pythonidae. What is the most common pet snake? Ball pythons are the most popular snakes, with corn snakes being a close second due to their small size and friendly nature. Ball pythons are good beginner snakes as they are easy to care for. They also come in a wide range of color morphs, and are readily available in local pet stores. There are around 3,700 species of snakes in the world. However, the vast majority of these snakes are difficult to manage and best suited for experienced keepers only. 1 What are the Most Common Pet Snakes for Beginners? 1.2.1 How Much Do They Cost? 1.3.1 How Much Do They Cost? 1.4.1 How Much Do They Cost? 1.5.1 How Much Do They Cost? 1.6.1 How Much Do They Cost? 1.7.1 How Much Do They Cost? 1.8.1 How Much Do They Cost? 1.9.1 How Much Do They Cost? 1.10.1 How Much Do They Cost? What are the Most Common Pet Snakes for Beginners? Here is a quick summary of the characteristics of some of the most popular snakes. We’ll then go on to explore the traits of each snake in greater depth. The ball python (Python regius) is the most popular snake due to its calm demeanor and the wide range of morphs available in the market. Ball pythons are good snakes for beginners because they aren’t heavy bodied like other snakes in the Pythonidae family, with females growing up to 3-5 feet in length and males, around 2 to 3 feet in length. They are long-living snakes, with some living up to 30 years in captivity. Moreover, with proper husbandry techniques, ball pythons are relatively easy to take care of. Unlike most pet snakes, ball pythons need some humidity in their enclosures, being native to western and central Africa. Due to their humidity requirements, it’s best to avoid using screen tops for their enclosure. Water bowls inside a ball python’s enclosure should be large enough to soak in and sturdy enough not to get easily tipped over. It is common for ball pythons to stop eating at any time of the year. A ball python’s fast may last for several weeks at a time. If your ball python looks healthy, this is not a cause for concern but if it starts looking skinny, see your herp vet immediately. 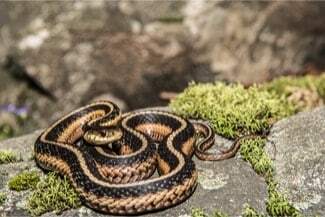 According to a study published in the journal, Zoology, snakes can bring down their metabolism by up to 72%, allowing them to go on without eating for extended periods. They thrive in 30-gallon enclosures. They are terrestrial species known for their defense strategy where they coil into a tight ball with the head and neck tucked in the center when threatened. In the wild, ball pythons spend the majority of their time hiding in mammal burrows and other underground hiding places, where they’ll remain dormant for extended periods (aestivation). Due to their placid nature, it’s important to keep at least two hide boxes inside a ball python’s enclosure. In most reptile shows and pet stores, the price for a normal ball python should start at around $30. If you’re looking for a morph, the price may vary according to the rarity of the breed. Here is some information on the price of pastel ball pythons. Most morphs come within the price range of $40 to $200. 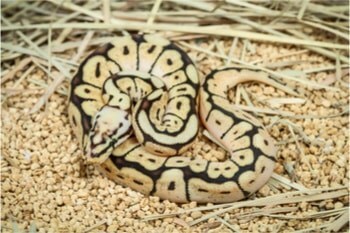 But if you’re curious, the most expensive ball python morph, the Lavender Albino Ball python, is reported to be $40,000. Also known as royal pythons, ball pythons are highly revered among the Igbo people of southeastern Nigeria. Being a terrestrial species, they are considered symbolic of the earth and are treated with care whenever they wander into someone’s property. Ball pythons are allowed to roam freely in Igboland villages, and if a ball python is killed by accident, the villagers may build a coffin for the snake and offer it a brief funeral. Here are some other cool facts about ball pythons. Corn snakes (Pantherophis guttatus) are among the most popular snakes due to their docile nature, wide array of color morphs. They have a slender build and round pupils. Most of them have vibrant orange or red backs with black and white patterning on their ventral region. They don’t grow too long, with most reaching 2 to 5 feet when they reach adulthood. Corn snakes don’t need large enclosures either and are very easy to breed. In the wild, a corn snake may live around 6 to 8 years, but with proper care, a corn snake may live up to 23 years or longer in captivity. 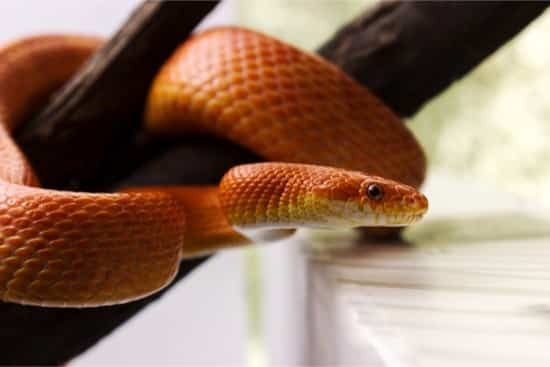 Corn snakes tolerate being handled even for prolonged periods. They are easy to take care of, with most adult specimens only needing a 20 to 25-gallon vivarium. Corn snakes enjoy burrowing and hiding. Therefore, it’s best to include a loose substrate such as aspen shavings, along with at least a couple of hide boxes inside their enclosure. In captivity, corn snakes are fed pre-killed feeder mice. Normal corn snake hatchlings are typically priced within the $25 to $40 range. Their pricing may vary according to their color variation and where you buy them. With new corn snake variations becoming available every year, there is a wide range of color morphs, pattern morphs, compound morphs and hybrids available in the market. You can also find scaleless corn snakes ranging from $100 to $1000. 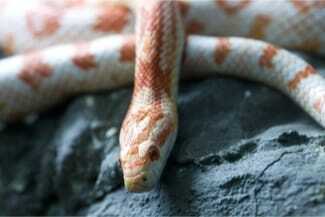 The name, corn snake, dates as far back as 1675 according to the Oxford English Dictionary. Corn snakes are named so because they were often found around grain stores, where they fed on rodents that consumed harvested corn. Some sources state that their name comes from their distinctive, checkered patterning on their bellies that look like corn kernels. Boa constrictors (Boa constrictor) are widely kept snakes, with the Colombian boa being the most popular subspecies. Boas are docile, although some wild-caught specimens may be aggressive. They are known for being more curious about their surroundings compared to other snakes kept as pets. Boas are available in a variety of color patterns and morphs. Boas can reach up to 10 feet and even longer, but they average around 6 to 8 feet in females and 5 to 7 feet in males. The average captive lifespan of a boa constrictor is 20 to 30 years, but can live for up to 40 years. Due to their long lifespan and size, boas are most suitable for moderate to advanced level snake keepers. 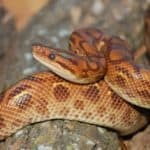 Here’s some information on caring for boa constrictors. Proper husbandry is the most critical factor in a boa constrictor’s lifespan and must include adequate space, appropriate food items, and the right temperatures and humidity. There are smaller subspecies native to Central America, such as the Pearl Island boa and the Tumbes Peru boa. However, these subspecies haven’t been bred as often as the Colombian boa in captivity and thus, may not be as tame. Boa constrictors are generally solitary creatures that don’t interact with other snakes unless they’re looking to mate. They’re mostly nocturnal but may bask in the daytime if nighttime temperatures are too low. Boa constrictors are also semi-arboreal. Young boas may climb into tree branches to look for food. However, they become more terrestrial as they get older and heavier. The price for a boa constrictor depends on the type of boa constrictor you choose and where you buy it from. At reptile shows, normal colored boa constrictors are sometimes sold for $60 to $75, and hypomelanistic varieties (reduced black pigment) can be found for as low as $75. At retail stores, they average around $150 to $200. If you’re looking for a designer morph, prices can be as high as $5000 or even more. While buying a boa constrictor, make sure that it’s from a reputable source and doesn’t show any signs of mites, respiratory illness, deformities or retained shed skin. Boa constrictors give birth to live young that become independent within minutes. They are viviparous, which means there’s no egg development involved in their reproductive process. The embryo develops inside the mother boa constrictor and is nourished via the placenta – similar to mammals. Because hatchlings are born fully formed, they quickly grow following their first feed and have to fend for themselves. California kingsnakes (Lampropeltis californiae) belong to the Colubridae family and are endemic to northern Mexico and the western United States. California kingsnakes are popular beginner snakes because they don’t grow too big, with most growing up to 3 to 4 feet when they reach maturity. They have attractive colors and patterns. Despite their calm nature, kingsnakes tend to get a little jumpy if not handled frequently enough. They are opportunistic feeders that eagerly prey on small rodents, lizards, birds, and eggs. They even eat venomous snakes. They are fairly easy to feed in captivity. Hatchlings tend to thrive well on appropriately sized pinkies, with the size of the prey as the snake grows. 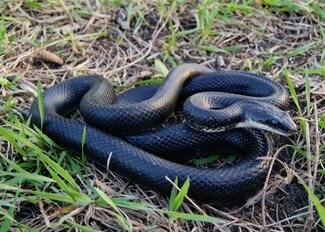 Adult captive kingsnakes can be fed frozen thawed mice or rat pups. California kingsnakes don’t need large enclosures and can be housed in 20-gallon enclosures with a screen top. They need at least two hides and a sturdy water bowl for the snake to soak in. They don’t require special lighting and mainly need under tank heaters to help them during thermoregulation. 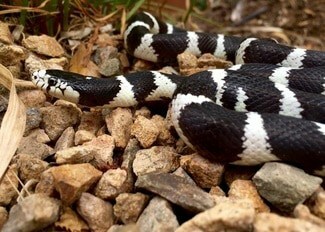 You can purchase a California kingsnake hatchling for about $50. Adult albinos may come in the upper $100 price range. California kingsnakes are considered kings due to their ability to kill and consume other snakes, including venomous ones. 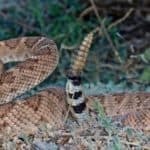 They are naturally resistant to rattlesnake venom, but not totally immune. Green tree pythons (Morelia viridis) are arboreal snakes that can add more interest to a typical snake vivarium. 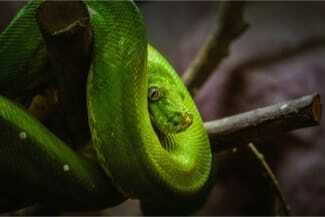 They’re popular due to their bright green and yellow color and their elegant way of resting in tree branches. They loop into one or two coils over branches with the head in the middle in a saddle position. They share this trait with emerald tree boas. Green tree pythons grow to a maximum length of 7 feet, with males being more slender than females. Most green tree pythons can live to their mid-teens, with some reaching their mid-20s with proper care and maintenance. They are a more advanced level species which require prioritized health and care. Juvenile green tree pythons can be shy, so hobbyists like to start with smaller enclosures and transitioning to larger enclosures, measuring 3 ft. long, 2 ft. wide and 2 ft. tall or 2 ft. long, 2 ft. wide and 2 ft. tall. Green tree pythons and most other arboreal snakes do not require very tall enclosures despite their tendency to climb frequently. Inside a tall enclosure, a green tree python will pick the highest perch and may not come down to the cage floor to drink water, resulting in dehydration. Active green tree pythons like to crawl horizontally through tree branches and other cylindrical objects, not up or down trees. Therefore, focus on more horizontal space and ensure the snake can comfortably reach the bottom to drink water from the highest perch. Not all green tree pythons are green. Despite their name, they come in many colors, in the wild and designer captive forms. There’s only one recessive morph for green tree pythons – the albino. Depending on the type that you choose, one will cost around $250 to $1000. Green tree pythons are becoming easily available, and more hobbyists are becoming successful in breeding them. Be sure to ask about the origin of the pet as most green tree pythons coming from Indonesian farms tend to harbor parasites that may affect their health later on. 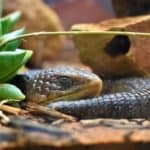 Look for a reputable breeder that has well-cared for and healthy snakes that haven’t undergone the stress of being transported from distant places around the world. Sometimes a green tree python may wiggle the end of its tail to lure its prey. It will sit and wait on a branch till a prey comes by below and strike quickly, snatching the prey and constricting it with its coils before consuming it whole. The rosy boa (Charina trivirgata or Lichanura trivirgata), belonging to the Boidae family is a popular snake among hobbyists due to its fairly docile nature and relatively smaller size. At full maturity, a rosy boa can grow up to 4 feet in length, but they generally average around 2 to 3 feet in length. They are long-lived species, which can live up to 25 years or more in captivity. Rosy boas are notorious for looking for escape routes when kept in captivity, so they should be kept in highly secure enclosures. 20-gallon enclosures are enough for adult rosy boas, but a screen top is not ideal as it can graze their noses. Hatchlings can start in small shoeboxes or similarly sized cages. Rosy boas are sand boas, and they thrive in dry, rocky habitats. They spend most of their time avoiding the heat by hiding underground and inside crevices. They’re highly skilled burrowers, so they need to be able to dig around inside an enclosure with a loose substrate. Making sure the substrate is about two inches deep will allow your rosy boa burrow. Rosy boas don’t need special lighting, but they do require a heat source, such as an under tank heat pad to help them during thermoregulation. Rosy boas should be fed appropriately sized mice 2 to 4 times a month and fewer times during winter. 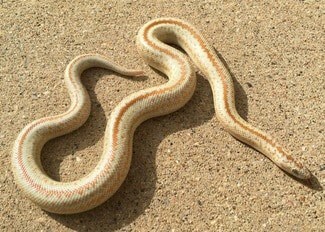 Here are some of the most beautiful rosy boa morphs. You can buy rosy boa hatchlings for $30 to $40 at reptile stores, shows and from online dealers. Unlike ball pythons and corn snakes, they aren’t readily available in big box retail pet stores. Rosy boas have a mono-shaped body with a blunt head and tail. This enables them to confuse predators as the latter cannot tell the head and tail apart. This makes it easier for them to burrow. Gopher snakes (Pituophis catenifer) are easily available at reasonable prices. They are muscular, heavy-bodied snakes with an average length of 4 to 5 feet when they hit maturity. The gopher snake’s specific name is catenifer, which translates to “chain bearing” referring to its dorsal splotchy patterning. They are called gopher snakes because they frequently hunt gophers. Gopher snakes are found in cream or light brown colors with dark blotches on their backs and smaller spots along their sides. Compared to other snakes within the same size range, gopher snakes have large eyes with relatively large heads and narrow necks. Most of them have dark lines along their faces that run from the top of their heads and go around either side of the eyes. Their coloring depends on the location and subspecies, often mimicking the colors of the local vegetation for camouflaging purposes. 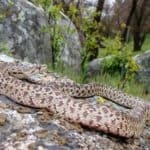 According to Stanford University, gopher snakes are considered necessary for maintaining their local ecosystems as they keep the rodent population in check. In the wild, gopher snakes live up to 15 years, but with proper care, they can live up to 33 years in captivity. They’re generally solitary snakes and spend up to 90 percent of their time in underground burrows and dens. In the summer, they’re found spending most of their time basking on warm rocks, which also makes them vulnerable to predators. They feed on small birds and mammals and actively seek out prey, often chasing animals down burrows. Therefore, they prefer loose dry substrate kept about two to three inches deep. Young snakes can start inside a 20-gallon enclosure and transition to 30-gallon cages when they become adults. 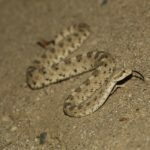 They don’t need special lighting and prefer basking temperatures of around 90 degrees F.
Gopher snakes come in a wide variety of morphs and are readily available starting at a reasonable price of around $50. You may be able to find them for cheaper at a reptile show. Gopher snakes are commonly mistaken for rattlesnakes as both have dark blotchy patterning on their backs, an overall brownish coloration, and relatively large heads. Both flatten their heads, hiss loudly and vibrate their tails when threatened. When a harmless species mimics the defensive behavior or a harmful species, it is called Batesian mimicry. 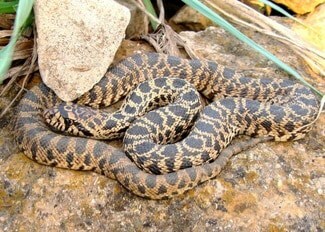 However, gopher snakes are usually longer and slimmer than rattlesnakes. They also have rounded pupils and not the cat-like, vertical pupils that rattlesnakes have. Here are some other interesting facts about gopher snakes. The western hognose snake (Heterodon nasicus), also called buffer, faux viper and blow snake, is a non-venomous, docile colubrid snake endemic North America. Their common name refers to their hog-like appearance, which is a result of a modified upturned rostral scale in their snout. This adaptation also makes them good burrowers. They are typically found in loose gravelly or sandy areas, such as sandhills, semi-desert areas, and prairies. They are relatively small and stout-bodied, averaging around 2 feet in length. They may live up to 18 years with proper care in captivity. They’re generally brown, tan, gray or olive in color with darker square-like blotches along their bodies. They have glossy black scales with tinges of white, orange or yellow in their ventral region. Western hognose snakes are best known for their harmless defensive bluffs, which are often impressive in adults and amusing in hatchlings. One may spread its jaws and flatten its neck mimicking a cobra when threatened. When attacked it may hiss and put on a dramatic show, where it twists and turns its body and rolls over as if it’s playing dead. 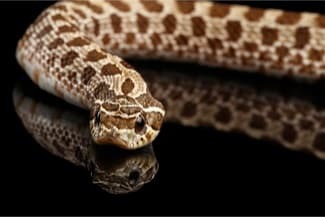 Western hognose snakes aren’t venomous, but they produce an irritating saliva that may cause slight swelling and itching in the area it comes in contact with. Luckily, it’s very rare to get bitten from western hognose snakes and even if you do get bitten, you can easily treat it at home with some soap and warm water. They’re also diurnal, so they need full-spectrum lighting 14-16 hours per day in the summer and 8-10 hours a day during fall. Prices may vary according to coloration and subspecies you choose. Western hognose snakes are becoming more readily available via online dealers, with most averaging around $60 to $150. When provoked further, it may stick its tongue out and even go as far as throwing up its last meal or bleeding from the mouth. The snake’s body will remain limp until it perceives no threat. Rat snakes are medium to large constrictors snakes that make attractive and docile pets. 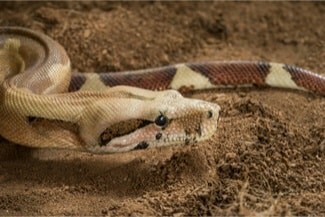 They have a reputation of being more rambunctious than other pet snakes but they calm down quickly with regular handling. Using a snake hook to pick a rat snake up can put the snake at ease and prevent any defensive or feeding responses. Most reach up to 4 to 6 feet in length, with males growing faster and larger than females. Rat snakes can live up to 10 to 15 years in captivity, and have a record age of 25 years. They have blotchy marking, with brown or dark gray markings over a lighter, earthier color. They prefer wooded or field habitats and thrive well in 55-gallon tanks. Rat snakes are typically active, so they need more room to move or else, they might get stressed in captivity. Rat snakes are also solitary snakes and prefer to be housed separately. Due to their highly active nature, it’s important that owners keep a lookout for rostral or nose rubbing. Having a big enough enclosure and making sure that all surfaces are smooth will prevent a rat snake from injuring itself. They don’t need any special lighting but establishing a light cycle with natural light can help avoid stress. Avoid direct sunlight’s and maintain a gradient of 72 degrees F to 82 degrees F to help them digest. Pricing often depends on the subspecies and where you buy your rat snake from. For example, you may be able to find an Everglades rat snake for $40 online or a yellow rat snake for $30. The more expensive varieties are often in the $150 to $300 range. 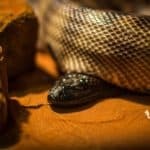 For the longest time, rat snakes were considered to be completely nonvenomous, but a study published in the Journal of Molecular Evolution suggests that some Old World species possess small amounts of venom. However, the amount of venom they possess is insignificant to humans. Garter snakes are excellent beginner level snakes due to their small to medium size and nearly harmless and placid demeanor. They are widely available in the snake market, with most species being relatively similar. They generally differ regarding their color patterns and food habits. For example, common garter snakes often prefer fish for food, while others may have a taste for worms. Garter snakes are non-constricting colubrid snakes that were once thought to be non-venomous. However, the small amounts of mild venom their produce cannot harm humans. Moreover, they don’t have an effective means of delivering their venom. Due to their small size and calm nature, they’re also considered to be safe for children, other than the salmonella they carry (which every snake does). Garter snakes are relatively slim-bodied snakes, with females reaching up to 3 feet in length and males about 2 feet, depending on the species. Baby garters are tiny, averaging between 6 to 8 inches. Garter snakes make excellent display reptiles because they tend to be very active and alert. They have excellent eyesight and smell which they use to capture prey. In the wild, garter snakes are usually found around water, such as lakes, marshes, rivers, and streams. Although no special lighting is needed, providing UV light may be beneficial as garter snakes are active during the day. Garter snakes do require basking temperatures between 90 to 95 degrees F to help them digest their food. Garter snakes aren’t long-lived snakes and may live up to 10 years in captivity. Garter snakes are relatively inexpensive, and are often sold for $15 to $50, depending on the subspecies and morph. Garter snakes have a high complex pheromonal communication system. They find mates by following their pheromone-scented trails. The pheromones produced by male and female garter snakes are easily distinguishable. However, sometimes, a male garter snake may produce both female and male pheromones to confuse other males during mating seasons.